This morning I made up my mind that today was the day I am going to sort out, declutter, and tidy the spare room. This room in the past has been the stockroom for my business, hence the metal shelving. Now it is mostly crafty stuff which has taken over. Oh dear, what a mess, it badly needs seeing to. After breakfast I spent an hour or so on the rag rug, I am wanting to get that finished, but I think I will need some more teeshirts. I will make enquiries about when the car boot sales start again. The weather wasn't too bad this morning, a bit chilly but dry, so I decided to go for a walk in the park at 12 o clock. I'll start the decluttering later. When I got back it was lunch time. I opened a tin of mixed bean salad, and put half of it in a dish with a portion of carrot soup that I had made and frozen. Zapped it in the microwave and ate it with a couple of slices of granary bread. Just the thing to warm me up. Oh gawd, boxes of stuff everywhere. I made a start. Then at 4.30pm my tummy was rumbling, better get the dinner on. I haven't got much left in the way of fresh food, but I have enough to make a three day stew. It's supposed to be a Rustic Ratatouille, that's what it says on the packet, even though mine looks nothing like the picture, ha ha. Worth a try with an out of date packet from the cash and carry for 20p. Anyway, my version of it is butternut squash, four small potatoes, one onion, the other half tin of mixed bean salad, and three handfulls of pasta. It tasted so nice I had to go back for second helpings. This should take me through till Sunday, I'll go shopping early next week. I have four eggs left and stuff in the freezer I can eat. Sorry about the blurry picture, I am no good at taking closeups with a flash. I had a lovely surprise in the post today, the postman doesn't normally knock on my door. A lovely blogger friend sent me a parcel. I have some pretty red fabric, golden ribbon, a stretchy key chain, a fridge magnet, packets of seeds, green cobwebby fabric, and something to soothe tired feet. Thank you very much Sue G, I am chuffed. It's blowing a hooley outside, looks like it is going to be a miserable weekend weather wise. Best get on with the decluttering then. I'll get onto it tomorrow. Hope you have a nice weekend. Hello. Thank you all for your interesting replies to yesterdays post. I enjoyed reading about where you live. 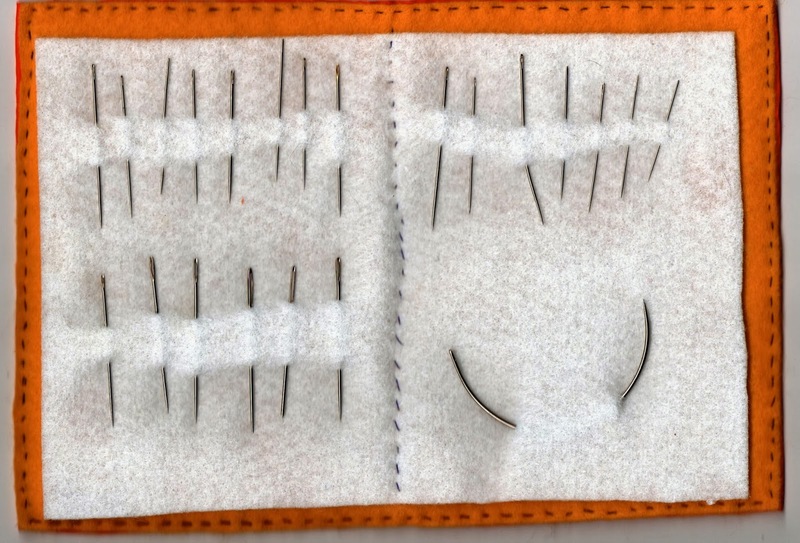 Someone asked what I was going to make out of my practice pieces, well today I have made a needle case. I had a piece of orange felt which I have used for the inside, and between the two layers I have put some window blind fabric, to stiffen it. I did a running stitch around the outside edge to hold it together. 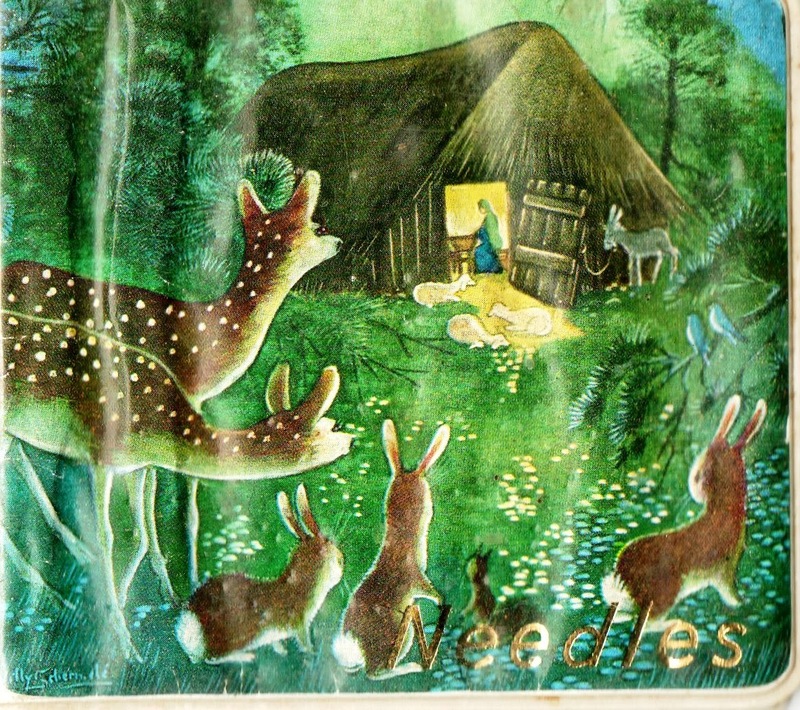 This is my old needle case, I have had it since I first started sewing at maybe 10 or 11 years old. The inside is falling to bits, it's a shame to throw it away, so I am going to give it a new innards. I will keep it. I've had my final gas bill through from British Gas, and surprise surprise, they owe me money. I'm still waiting for the last electricity bill, and I suspect that will be the same, because the previous bills they over estimated, then I sent in the final readings which were less than they guessed. When I get the bill I will be ringing up to ask for my money back. Ebico are my suppliers now. I've just been watching a programme on BBC about two identical twin brothers, both doctors. One went on a fat only diet for a month, and the other a sugar only diet. They went through all sorts of tests, some of them I didn't quite understand. I also got confused about which brother was which, they should have worn name badges which would have made it easier to identify them. Anyway, it seems that both of them lost a bit of weight. The conclusion was, it's not fat on it's own which is bad for you, and not sugar on it's own either. You wouldn't eat spoonfuls of sugar, or pints of cream, because your brain is programmed to tell your body when you have had enough. It's the combination of both which is bad for you, because any food which has fat and sugar in it tastes nice and you are tempted to eat more of it. Your brain doesn't know when to stop stuffing the cakes and biscuits in your mouth, the messages are not sent, so you keep on eating. That explains why I can't just have one biscuit or one cake, it's best that I buy hardly any of them. I was going to go shopping tonight, but I can't be bothered. It's two weeks since I last went to Tesco. I have enough food to last the weekend, and can eat out of the freezer and cupboard. I will leave the shopping until next week. Well it's getting on for eight o clock, so I suppose I'd better write something here. So what do you write about when you haven't anything prepared? When you haven't done much to write about except potter about the house doing little jobs like cleaning the cat's litter boxes, washing the pots, changing the bed, and cutting fabric up for a rag rug. I usually manage to pluck something out of the air, even if it might be a load of waffle. I can say anything I like really, it's my blog. I can say stuff it I can't be bothered, but I won't because I can be bothered. Let's see what I can ramble about. Do you want a bit of village news? There are contractors in the next street digging the road up to put new drains in. This has to be done before they can make a new parking area for residents who at the moment have no off street parking. When it is done they will be able to park their cars in front of their own houses. How do I know this? Because I am nosey and I asked a man who was digging the hole. Several street lights were not working a few weeks ago. Someone came and fixed them. Now the telecoms people have come to replace some telegraph poles. They are making a right mess, driving their trucks and JCB's over the grass verges. We have two cheerful postmen in our village. They come in a van, and wheel their trolleys around delivering mostly junk mail. As you know I don't like junk mail, but if it keeps them in a job then so be it. They are always friendly and say Hello. 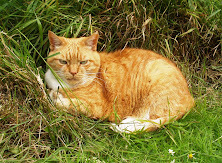 My friend who has been cutting the grass in the churchyard has now retired. He had to have a pacemaker fitted, this was a wake up call. He is 73, and was going to carry on working until he is 75, now he can relax a bit and go rambling with his friends, walk his dog, and go for a pint in the club. I am pleased to report that his job was advertised and a new man will take over looking after the churchyard. I am happy that it won't get neglected and run down. This new man is newly retired from his full time job and was looking for something part time. Perfect really, and he lives close to the church. There seem to be a lot more dogs in the village, it's nice to see them being walked. It would be nicer if all the owners picked up their poo. I took Lady out for a walk this afternoon, and she couldn't have done her poo in a more convenient place. On top of another pile which had been left, and right next to the dog poo bin. Clever girl, ha ha. Tesco nappy bags are very cheap for this not so pleasant job, only 35p for 300, so I don't know why people don't pick up. We get a newsletter every so often from the Conservative party. We used to get a church newsletter but they couldn't find enough volunteers to carry it on when someone stepped down. We have a parish council who do a newsletter, and several notice boards in the village as well as the notices in the shop windows. I have a thing about notice boards, I have to read them, wherever I am, in any town and any village. I am just nosey, I want to know what's going on. When I moved to this village someone was supposed to move in with me. We looked at houses together. He said he wanted to live somewhere away from other people, in the countryside, in a cottage with some land, down a lane. I had a feeling that wouldn't be quite right for me. I was beginning to have doubts about the relationship, would it work. Then I found the house I am living in, he said it was ok for him. I chose it because it has space around it, big garden wide road, not living on top of your neighbours. It's close to the village centre, and I can see people walking by. I wanted to be part of the community but still have my own space. I was right to choose this house. He didn't move in with me, my doubts were correct. Imagine what would have happened if I had moved to an isolated cottage and then the relationship broke up. I would have been on my own and lonely. I'm glad I went with my gut instinct, and let my head rule my heart. I love my life in the village. I can shut myself away in my house if I don't feel like speaking to anyone. I like my own company by the way. Or I can go out and about in the village. I know lots of people, I have friends. I know lots of dogs and their owners, in fact I can hardly get out of my street without meeting someone to pass the time of day with. The neighbours around me are friendly. It's funny really, I like living here, but then I also like going away to visit other places. I think I have the best of both worlds. This will suit me for the time being. What do you like about where you live? If you were to move would you choose somewhere different? Told you I am nosey, ha ha. I think I've got the hang of this now. The weather has been awful, so another day in the crafting studio, aka my living room. I haven't got one of those wooden embroidery hoops so a bit of imagination was needed to find something else which would do the job. Take one wooden picture frame, remove the backing, picture, and glass. Then stretch the fabric and net over it and secure around the edges with plastic clips. I used a piece of curtain lining fabric for the first practice piece. The mesh I used was very fine. I found that stretching it can alter the shape of the squares, these are more like diamonds. It is important to stop the mesh from moving while working on the piece by securing it tightly around the edges. The mesh is removed. These stars are quite tiny and not all exactly the same. I don't think it matters. 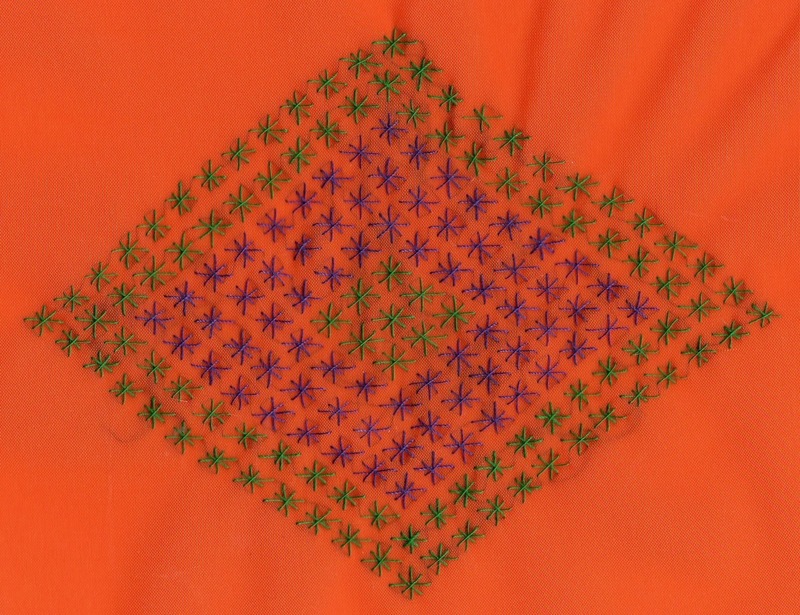 The second one I did was on a piece of orange silk, using two colours of cotton. The silk was slipping a bit and I had to adjust the clips as I was working on it. Some of the lines are a bit wavy. It would probably be better to use a hoop for slippery fabrics, to stop it moving about. 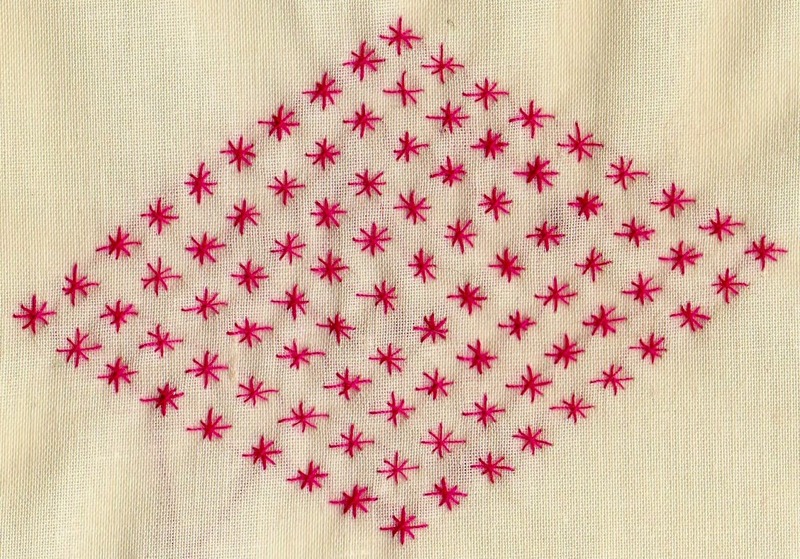 This reminds me a bit of cross stitch, each star is two crosses, one on top of the other. I needed to get quite close to it when I was stitching, because it's important to push the needle through in precisely the right place. This meant bending forward, and suspending it between my knees and the table. I had to keep stopping to straighten up as I was quite uncomfortable. It would be better to find a way of lifting the work to eye level, perhaps using a free standing embroidery frame, or using a magnifying glass which hangs around your neck. That would stop the need to lean forward and scrunch your body up. I need to get more organised before I do any more of this. Sitting hunched up is no good for my stomach. Back to the rag rug tomorrow. We had a lorra lorra laffs at the crafty club this morning, all were all in fine fettle, I'm sure we must have been heard along the length of the High Street. Folks must wonder what the crafty ladies are getting up to. We never stop nattering the whole time we are there. Such an entertaining lot. We also pick up new ideas, the ladies have such a diverse range of crafty talent and like to share. Here is one I thought I would pass on to you. I am going to have a go at this. Stretch a piece of netting from a fruit bag over a piece of plain fabric, and clamp them down tightly in one of those wooden ring things. Then proceed to use the grid as a guide and embroider inside the squares. Lots of crisscross star shapes in the same colour are pretty. I think you could also embroider over the top of the mesh, fastening each corner of the squares to the fabric, rather than use it as a template, it could be part of the design. You could also add some tiny beads to the design. Then when the piece is finished you can turn it into something small like a scissor case. Add a few beads for embellishment. Put a lining in it. And add a bead and loop to fasten it. Doesn't it look cute. Another member brought in two bookmarks that she has made. Some delicate cross stitching here. She has put a red backing onto them. I love these colourful designs. Lots of ideas and not enough time. Must get on, I want to try the sewing through net. There's only one thing for it today, stay indoors for some pamper time and home comforts. The weather is horrible, lashings of rain and gale force winds. Step outside at your peril. No, best stay indoors. I've spent some money today, central heating and hot water needed. A full body exfoliation, that's a good scrub up in my language, a lounge in the bath, and a glass of vino. Aaah, bliss. All sparkly clean from top to toe. Then downstairs for some comfort food. Lentils, swede, sprouts, potatoes, and onion. Can't beat it. Enough for two more days. 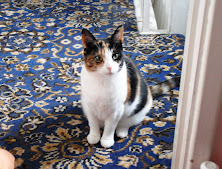 I'm going to carry on with the rug now. The rain has eased off so I might venture out for half an hour. Catch you tomorrow. Toodle pip. Do you ever get those small catalogues through the door? Do you look through them, or do you bin them without a second glance? They are not like the big catalogues where you order loads of overpriced stuff, then get into difficulties with the monthly payments when you fall on hard times. These smaller ones are usually pocket size with about 50 pages, full of gadgets and stuff you have happily lived without for all of your life. I've got one here, it wasn't delivered to my house, but to my friends, I happened to pick it up and have a nosey through it. Browsing through a catalogue is like browsing round a shop, they are full of things you would never dream of buying, but if you do it from the comfort of your own armchair, in your own living room, you might be tempted to splash out on something. Oh go on, why not, like the shopping channels, just ring a number and place your order, it's so easy. The thing is, if you hadn't picked up the catalogue in the first place, you would never have known you needed what you think you need, until you saw it on the page. 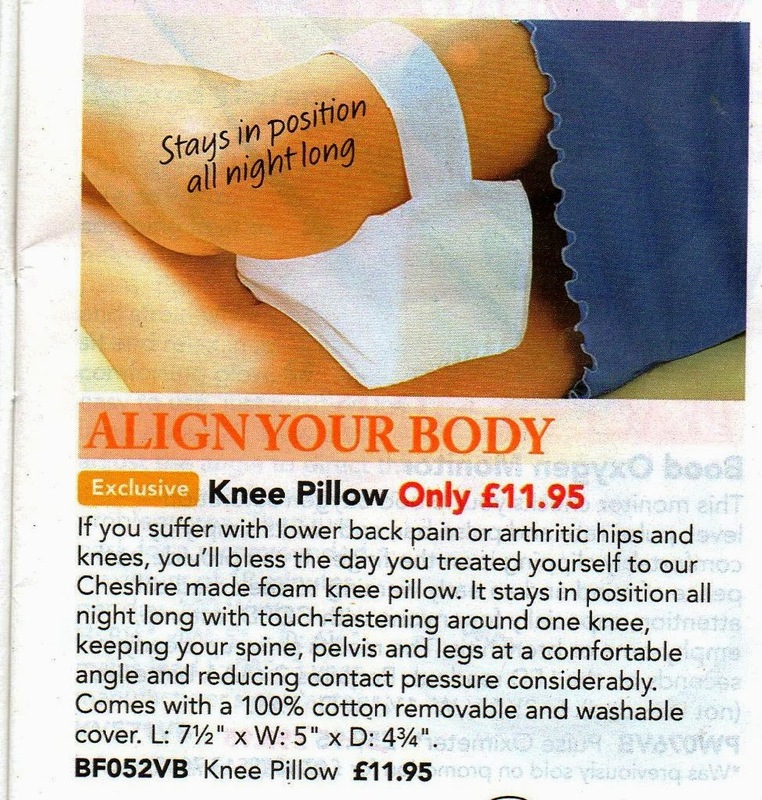 In fact, needed is the wrong word, there is nothing in this catalogue that I actually need. 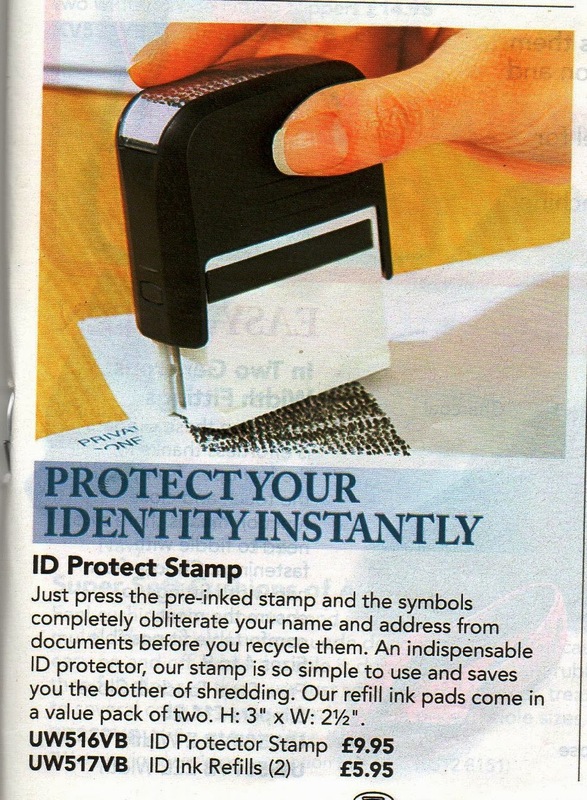 Do you actually need a little printer machine to obliterate your name and address from your mail before you bin it? What did we do before this little gadget was invented? We got a pair of scissors and cut it out of course, or even tore it out if we didn't have any scissors to hand. The rest of the letter can go for recycling. So, for £10 you get the stamp, and blow me down, you then pay £6 for the ink refill pads forever after. I'll stick with the scissors thank you very much. The mind boggles at this one. A discreet hair removal gadget you glide over your skin and it whisks away unwanted feminine hair. Ok, some might want to tidy up their bikini line, but read the blurb. Why would you want to stow it discreetly in your handbag for goodness sake? 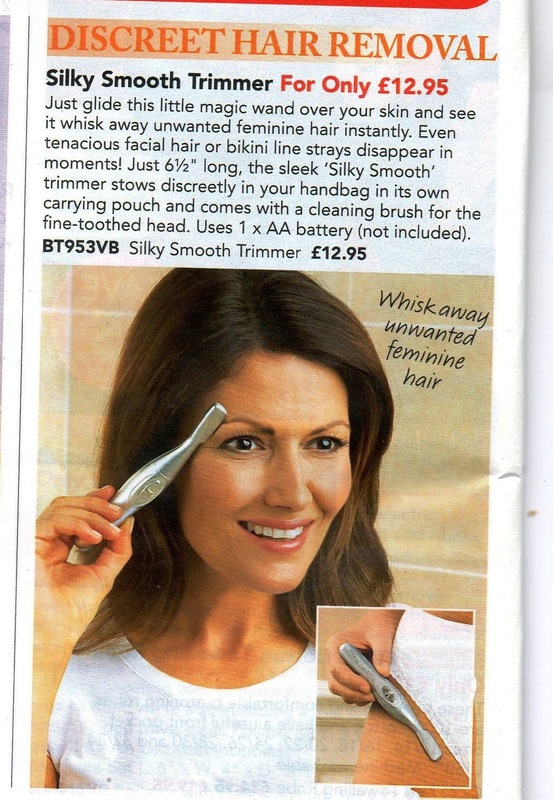 So that when you pop into the ladies in the pub and look down, you think golly gosh, and whip your little gadget out! I don't think so! Well we've all got to get one of these haven't we? 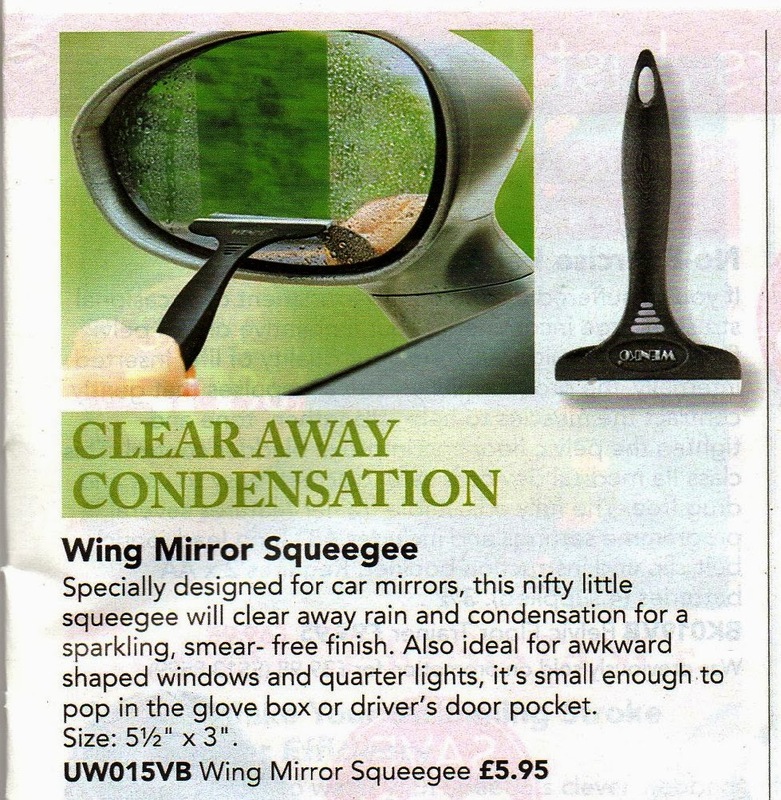 What do we do when our wing mirrors are misted up? We get a chuffin cloth and wipe them. Oh for goodness sake. Throw away £6 if you like, but I won't be getting one. I can't quite believe what I am seeing here. Strap a bit of foam to your leg when you are in bed. It will cost you £12 to buy it. What! I'll tell you what I do, it works just as well and it's free. I mainly sleep on my back, with a normal pillow half way down my bed, under my knees. When I turn onto my side, I move the pillow to between my knees, just like this. No need to buy anything. Now this is a good idea. 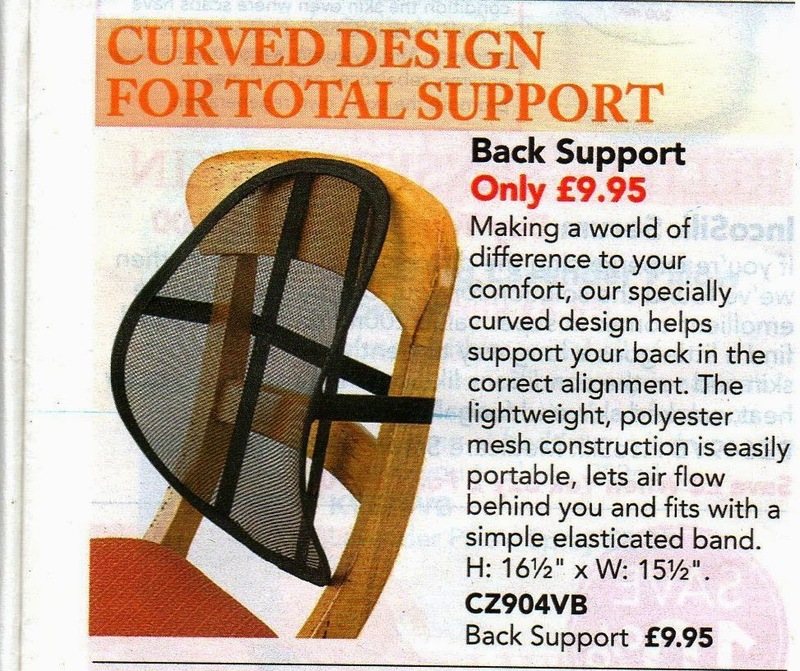 I have two of these back support thingy's, but they didn't cost £10. I got exactly the same thing from the £1 shop. One lives in my car, and the other is on my office chair. I have no backache at all. The catalogue is in the bin. YAY, a sunny day, I need to do a bit of tidying up in the garden. Found the old rigger boots, it's a bit swampy round here, and the mud sticks to my feet. One raised bed to dig, and pull out the weeds, then lay the last of the compost heap on the top, before covering it for the winter. Oh, it is winter, ha ha. Mayze enjoying a sunbathe in her garden bed. This is my den, a home made greenhouse. The plastic roof is very strong, but the sides need recovering. It doesn't help that the cats climb up it and sit on the top. I have plenty of shrink wrap left for that job, will leave it til the spring. It's amazing how this is still standing after all the wind we have had. It's a little sun trap here, pity the view is not very attractive. The back end of a tumbledown wreck of a garage is not something you would want to spend time looking at. I used to build den's in the garden when I was a child, and I'm still doing it now, ha ha. Digging down into the bottom of the compost heap I found lots of these wriggly little fellas, great aren't they. They are now getting settled into their new home, and hopefully turning the raised bed into a fertile heap of muck, ready for the next crop. There will be the usual basic veggies grown this year. The tried and tested, potatoes, runner beans, broad beans, and courgettes. Maybe one or two others, but I won't be mollycoddling them. They either grow or don't grow. When the weather gets warmer, I want to be off out somewhere. Once again it's the weekend. I hope yours is a good one. Toodle pip. What a gloomy morning today. Even though I got up when it should have been daylight, it wasn't, and I had to switch the light on in the kitchen to make my breakfast. It was chucking it down with rain all morning, gradually easing off just before midday. Nothing for it but to get on with indoor hobbies. 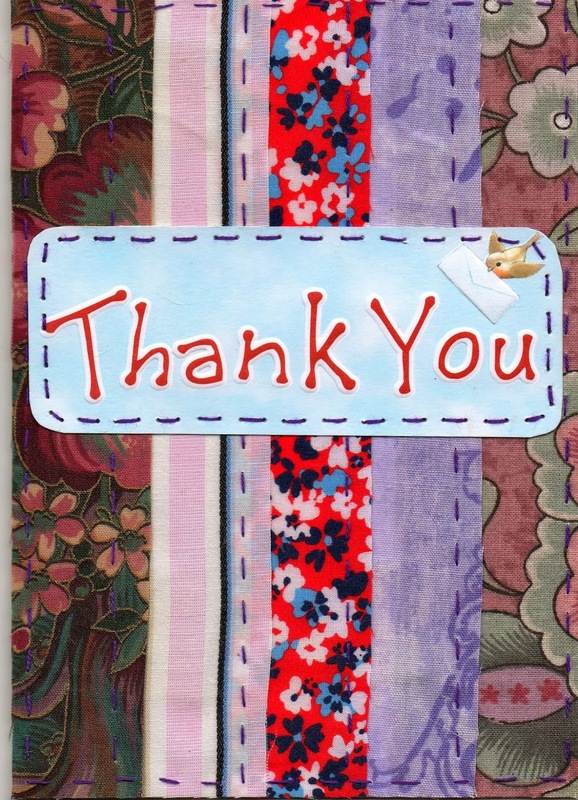 The rag rug was pushed aside in favour of making cards. I fancied a change, even though I said I might not make any more cards after I had a clear out of all my bits and pieces. An idea came to mind which I wanted to try out to see if it worked. I fancied using fabric. So this is what I started with. 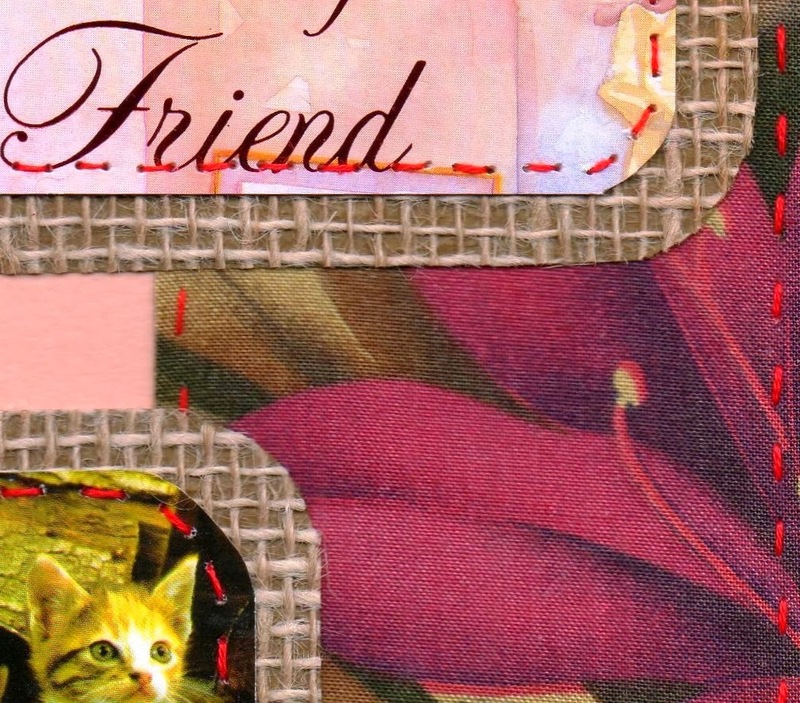 Small picture of cats, snippet from an old card, a piece of fabric, and two pieces of hessian wallpaper which is about 25 years old. A roll left over from papering the living room in my first house, ha ha. I have some plain blank cards of assorted colours, and this is how I arranged the pieces. 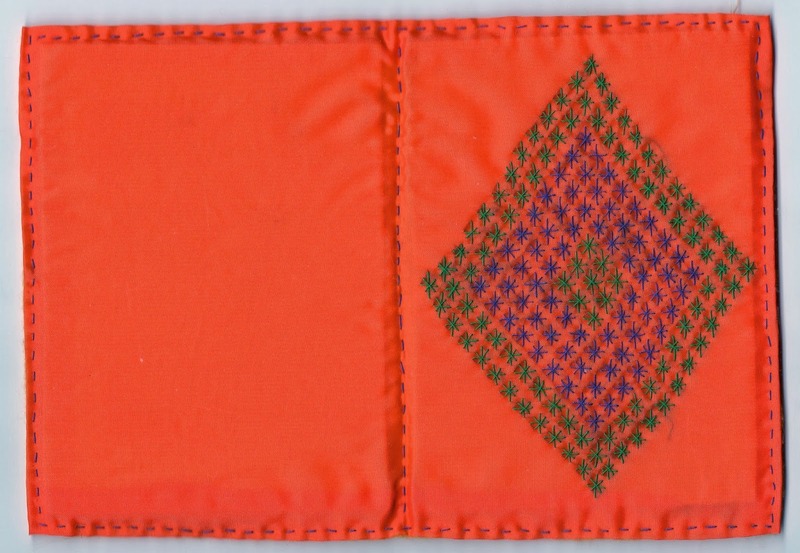 Sewn on with small running stitches in orange embroidery silk. I am pleased with it, it looks fab in real life. These pics are scanned by the way. Then I decided to try something else. 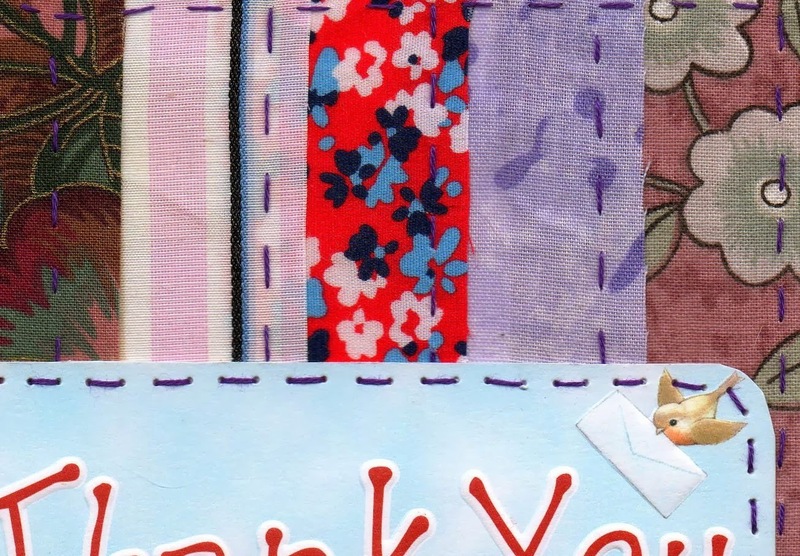 Cut five strips of cotton fabric to cover the front of the card, sewn on with purple thread. 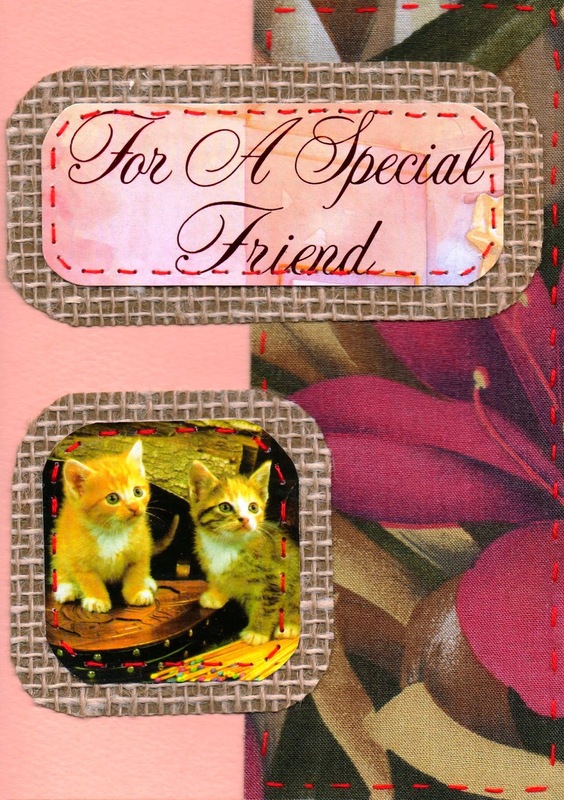 Then add a snippet from an old card. 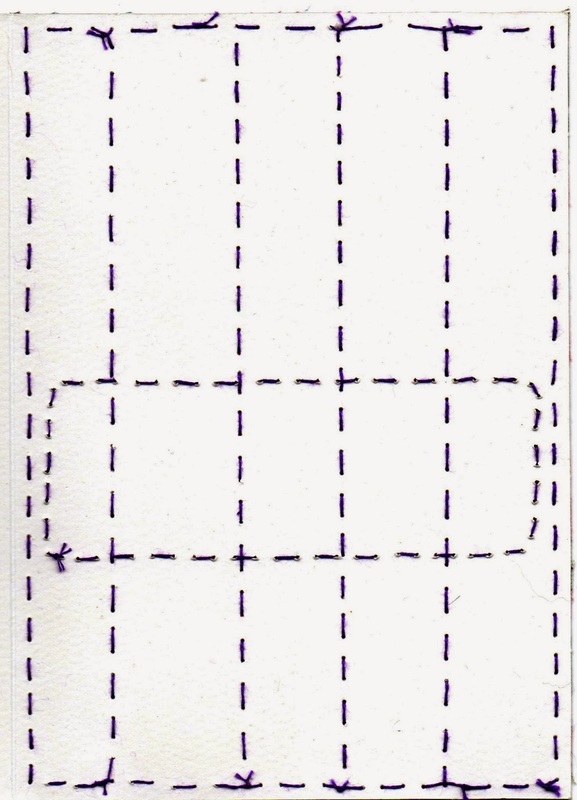 I first did a practice card, sewing the strips on with the machine, doing a zigzag stitch, and adding them one at a time. Looked a bit wonky. I might try again, sewing the strips together first, then sewing them to the card. The stitching on the inside has to be as neat as the outside. It doesn't matter about the little knots, it adds to the hand made look of the card. Inside I put a plain paper insert, which is tied in the middle with thread. It is left blank for a message to be hand written by the sender. I quite enjoy making these, I like playing around with bits and pieces. Keeps the creative juices flowing. I'm starting to get itchy feet again, it's been a long time since I went on a big walk. I'm not going till the weather picks up, thinking maybe March/April. It's at the planning stage, checking maps, reading books, and looking on the internet. I'll let you know when and where. Ooooh, excited. I was just thinking about my meals, how easy they are to make. How simple they are and how quick I can rustle something up. I have been preparing food this way for many years, using my own imagination when it comes to which ingredients to use. My tastes are simple, I know what I like. I don't have tons of those small glass spice jars, I don't need them. I don't posses a cookery book, I did have one but as I hadn't looked at it for 30 years I gave it to a charity shop. They might be great for those who can't cook very well, or want to try new recipes, but I can cook, and I'd rather stick with the food I like. Some people might think that would be a boring way to eat, same old, same old, but I can vary my meals by switching ingredients, which largely depends on what was on special offer or reduced at the supermarket. My theory is that you can spend many hours in the kitchen, preparing, chopping, boiling, stewing, smashing, casseroling, wrapping things in pastry, mixing, mashing, then smothering in sauce, and the outcome is still the same, you serve it up on a plate, it gets eaten, and it's gone. I get the same result with my simple meals, except they take me longer to eat, because I chew every mouthful very carefully and savour the natural flavour of every ingredient. I use the few spices I have very sparingly, so as not to overwhelm the taste of the vegetables I am cooking. Life is made a lot simpler by not eating meat. I make a veggie stew, it can be ready in 15 - 20 minutes when I do it in a pan on the top of the gas cooker. Add meat to it, and depending on the cut, it can take an hour or more. Put a meat dish in the oven and you're looking at a couple of hours. I am not on a mission to turn everyone into a vegetarian, each to their own, but from the look of some of the meat on the butchers slab as I walk through the market, it would be more suited to serve it up to the dog. Anyway, that's my opinion, you eat what you like. I am of the mind that the closer you can get to raw, simple, and non mucked about food, the better it is for you. Boiling vegetables is sacrilege, I never do it. If I make a stew obviously I am boiling them, but then the water is flavoured with spices and is eaten as part of the meal. Steaming is the way to go, either in the microwave or on the hob, or in an electric steamer. I prick them with a fork to see how they are doing and remove from the heat the minute they are done. There's no soggy sprouts or mushy spuds in this house. I am mindful of how much oil I use, it's hardly worth me buying any I use so little. I do like toasted sesame seed oil though, it tastes lovely. I drizzle a bit on my steamed veg, it gives them a lovely nutty flavour. But, I am on my last bottle which I got from the cash and carry for £1. It might be a long time until they get any more in, so when it's gone it's gone. They sell a small bottle in Tesco for around £1.50, I won't be paying that, so I will do without. This is what I had for my lunch. Simple and non mucked about. Salad leaves, coleslaw, and some of yesterdays pasta. I deliberately made extra for my dinner last night, which I had with the last of the cheap home made vegetable soup. Tonight is steamed sprouts and broccoli. If cooking is your hobby and you enjoy it, as long as you get the pleasure from all the time you put into it, that's fine. My food is simple slap it on a plate type of food. I don't eat with my eyes, and I don't need to create masterpieces. All these cookery programmes which pile farting bits of food on top of each other, with not enough to fill a gnat's belly, you can keep them. I don't watch them, I've seen the trailers, and the pictures in magazines. What's it all about eh! 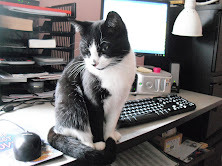 Blimey, I should have asked Nellie to write this post, ha ha. Hola Ilona! Estoy de España! I read your blog for a long time but dont'' write hi. Please blog us about your life in Mallorca, Gracias, Maria. Hola Maria, thank you for your comment, your wish is my command, but please don't expect any Spanish from me. I learnt a little but now I have forgotten. After all it was forty years ago. 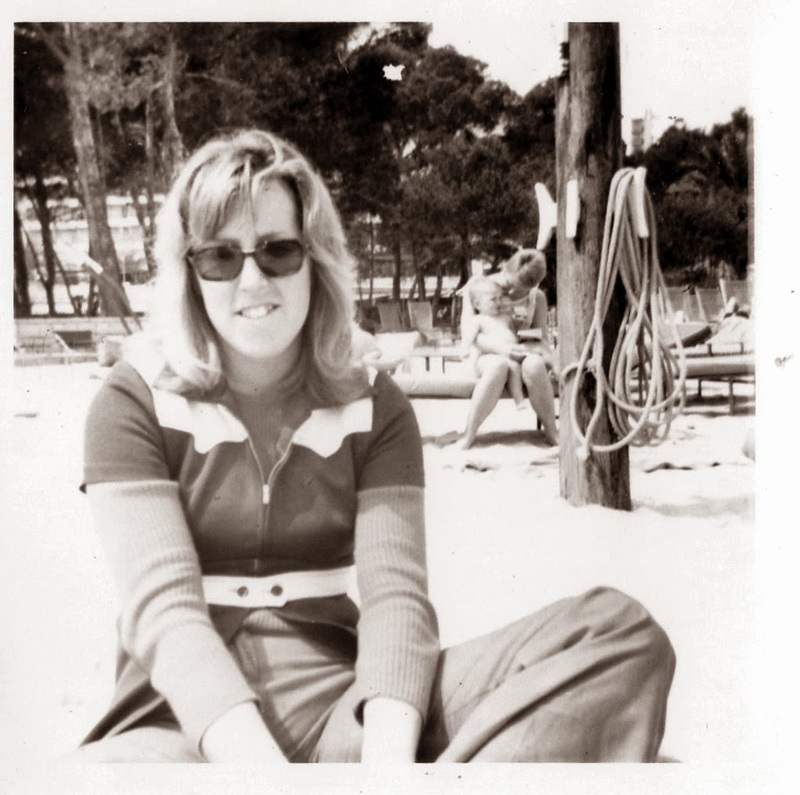 My first overseas holiday was to Magaluf, I went with my friend Janet, and we liked it that much we decided we would go and live there and find some work. We booked a holiday to go to Palma Nova the following March. It was a five day all inclusive package trip, but we didn't come back. It was the cheapest way to get there, rather than booking a scheduled flight only. 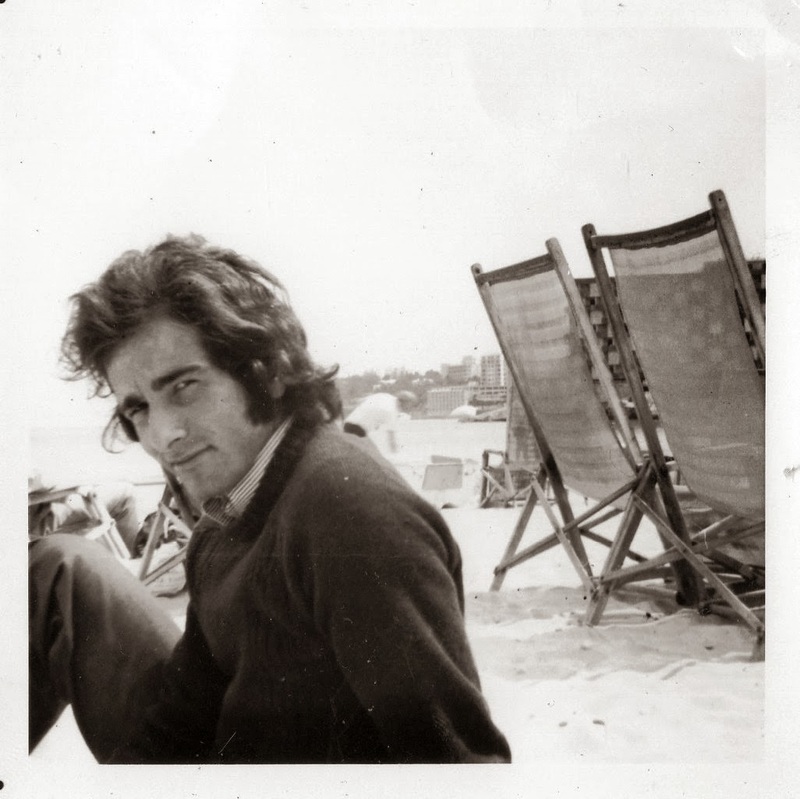 It was in 1973 and I was 24 years old. After the five days we had to leave the hotel, or pay for some extra nights. We couldn't afford it and looked for cheaper accommodation, perhaps a flat share. I had met a boy and started going out with him, and when he heard that we didn't have anywhere to stay, he said we could move into his flat with him. It was a relief to have somewhere to go. My boyfriend was French, so despite the language difficulties we managed to communicate ok. I have his name written down as Chemari, I have no idea if that is the correct spelling but that's how you say it. 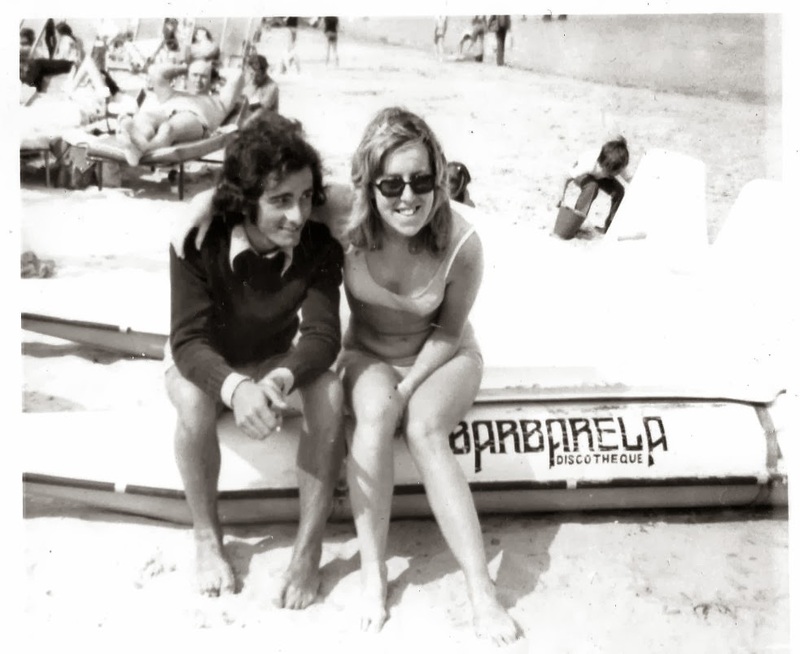 He worked on the beach renting out pedaloes, and I used to go down there and sit with him and take his lunch. There was an English newspaper and every day Janet and I searched for a job. We were prepared to do hotel work, clean rooms, or bar work, looking after children, or shop work. We went for an interview with the manager of a hotel, but he said we were too early in the season and he couldn't start us until later. A few weeks later we still hadn't got a job and Chemari was feeding us. Every time we asked for a job it was always manyana, come back tomorrow. Our money was getting very low, then Janet ran out altogether, although I had a bit left. Janet was worried, and contacted her parents, who paid for an air ticket to get her back home. I couldn't do that because there's no way my mother could pay for me. 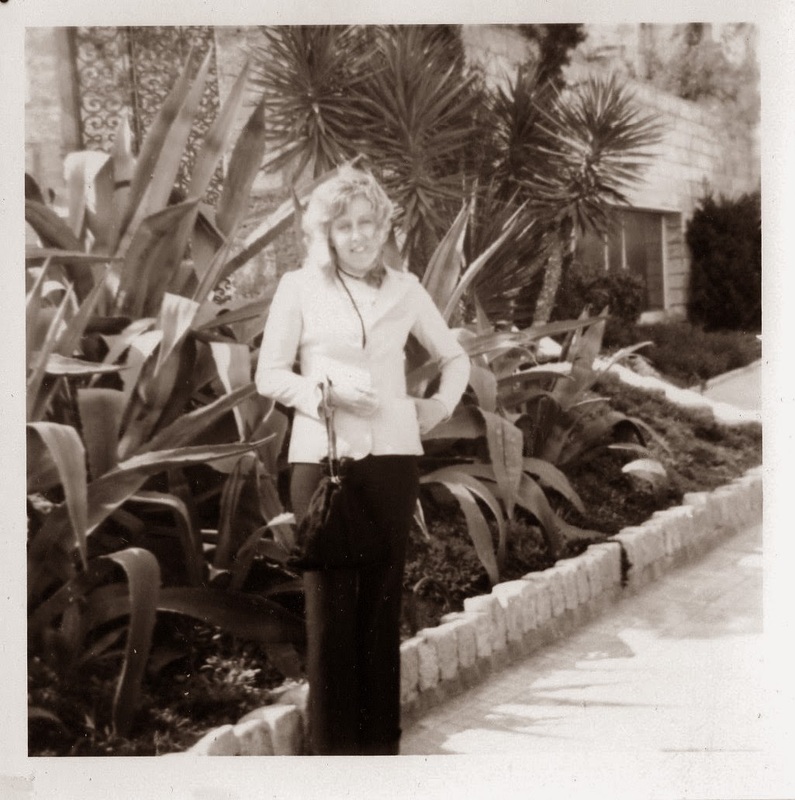 A week later, Chemari gave Janet her taxi fare to the airport and she went home. I was on my own, with no job. I had almost given up, what with the language difficulties, chasing non jobs, and no one showing any interest in me, it seemed hopeless. I spent most days either in the apartment or at the beach with Chemari. I had tried to get a ticket on the same flight back as Janet, but didn't have enough money. I was stuck. I started to see a different side to Chemari, he became very possessive and wanted to control my every movement. I remember one time I was sat on the beach while he was renting out his boats, and heard a man speak in English. It was such a relief to hear my native tongue, I started a conversation with him. Chemari became very nasty and accused me of chatting him up. I knew then that I had to get away. It was never in my nature to take handouts from anyone, and I didn't like having to ask Chemari for money for the shopping, although he was happy to keep me. I still had a bit of my own money left, and wanted to keep that for emergencies. I couldn't get a job, I wanted to go home. Every day I looked in the English newspaper, there was sometimes small adverts from people who had come to Majorca on a package trip like we had, then sold the return part of their ticket because they had already got a job lined up. A few days later I found a ticket, and rang the number. Success. It was a price I could afford, just. In the few days I had to wait for the flight, I didn't tell Chemari about it. I was afraid he would be angry and destroy the ticket. The person who sold me the ticket provided a car to the airport, there was a second ticket which someone else had bought. We were due to leave at midnight, and I told Chemari I was going two hours before, promising that I would be back. He didn't kick up a fuss and let me go. I knew I wouldn't be going back. When I got to Heathrow I had just enough money for the train home. That little adventure lasted about two months. I wasn't new at standing on my own two feet, as I left home at 18. I was confident about looking after myself, but alone in a country where they spoke a different language was a bit scary. There were some English people living there, but nowhere near the amount there are today. 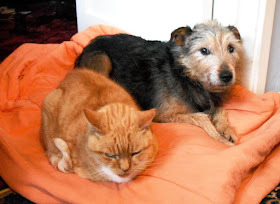 If I had got a job straight away it might have worked out, but for me to rely on someone else to feed me and put a roof over my head is a big no no. I had to earn my own money, reliant on no one. It was an interesting experience. I was straight into another job when I got back home. A bimble round Burton on Trent.